Most biomolecular recognition processes in biology occur via specific interactions. Sensory processes such as taste and smell, however, use “differential” binding where the receptors bind to their analytes through selective rather than specific interactions. (Figure 1). Inspired by human olfactory system, the sensing area in the Rotello Group focuses on the design and development of nanosensors for on a broad range of bioanalytes: proteins, bacteria and mammalian cells. In brief, selective interaction between the sensors and analytes generate distinct response patterns which can be used as the signature for analyte of interest. This array-based sensing strategy offers the benefit of detecting subtle changes in complex patterns. Successful examples have been reported in bacteria, mammalian cells, and drug mechanism in our group. Figure 1. 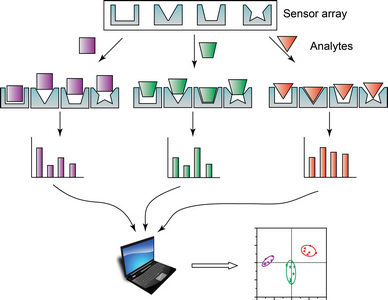 Schematic illustration of chemical nose sensing using differential recognition of analytes. Distinct patterns are generated and further processed by multivariant analysis methods. The matrix data’s dimensionalities can be reduced to non-overlapping clusters for easier visualization. In the Rotello lab, we work on co-engineering nanoparticles and fluorescent materials (polymers or proteins) to create more effective sensors. Gold nanoparticles (AuNPs) have tunable surface functionalities and strong quenching ability. The fluorescence from either protein or polymer is initially quenched by AuNPs, whereas proteins, bacteria, or cancerous cells can disrupt such interaction producing distinct fluorescence response patterns. The patterns are then statistically analyzed using linear discriminant analysis (Figure 2). Figure 2. A few examples of sensor platform developed in lab. a) host-gust double array b) fluorescent polymer and protein array used for cancer cell discrimination. One key area of sensing is to develop rapid sensors for cell phenotyping. Cells are extremely complex but well-organized. Many interactions are happening inside the cells and ultimately reflected on the cell surface, resulting interesting phenomenon. As a result, much valuable molecular information is harbored in the physical properties of cells, yet it is challenging to extract such information in a quantitative and reliable way. 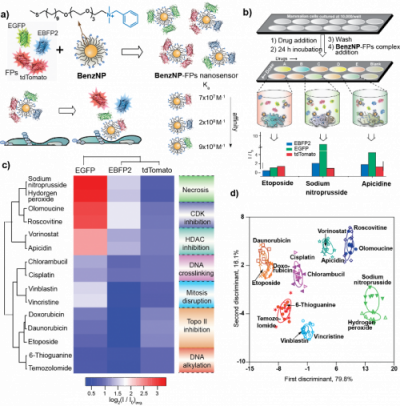 To solve the problem, we aim to employ array-based sensing as an alternative strategy to obtain such information through cell phenotyping. This rapid and informational rich method will give use more insights on cells and their dynamic interactions with the surrounding environment. Recently, we developed a one-well/one mechanism sensor platform with the potential for high-throughput screening. Without requiring additional processing steps, our approach interrogates the cell surface phenotype in response to varying chemotherapeutics using a standard plate-reader and culture plates to generate information fingerprints for each analyte (Figure 3). In the ongoing studies, we are exploiting both novel sensor platforms as well as interesting biological systems to apply this methodology. Current projects feature in cancer stem cell research, environmental toxins, heart disease etc. 1) Le, N. D. B.; Tonga, G. Y.; Mout. R.; Kim, S-T.; Wille, M. E.; Rana. S.; Dunphy, K. A.; Jerry, J.; Yazdani, M.; Ramanathan, R.; Rotello, C. R.; Rotello, V. M. “Cancer Cell Discrimination Using Host–Guest “Doubled” Arrays” J. Am. Chem. Soc., 2017, 139 (23), 8008-8012. 2) Duncan, B.; Le, N. D. B.; Alexander, C.; Gupta, A.; Tonga, G. Y.; Yazdani, M.; Landis, R. F.; Wang, L-S.; Yan, B.; Burmaoglu, S.; Li, X.; Rotello, V. M. “Sensing by Smell: Nanoparticle–Enzyme Sensors for Rapid and Sensitive Detection of Bacteria with Olfactory Output” ACS Nano., 2017, 11 (6), 5339-5343. 3) Le, N. D. B.; Wang, X.; Geng, Y.; Tang, R.; Tonga, G. Y.; Jiang, Z.; Rotello, V. M. “Rapid and ultrasensitive detection of endocrine disrupting chemicals using a nanosensor-enabled cell-based platform” Chem. Commun., 2017, 53, 8794-8797. 4)Rana S.; Elci, S. G.; Mout, R.; Singla, A. K.; Yazdani, M.; Bender, M.; Bajaj, A.; Saha, K.; Bunz, U. H. F.; Jirik, F. R.; Rotello V. M. “Ratiometric Array of Conjugated Polymers–Fluorescent Protein Provides a Robust Mammalian Cell Sensor” J. Am. Chem. Soc., 2016, 138, 4522-4529. 5) Rana, S.; Le, N. D. B.; Mout, R.; Saha, K.; Tonga, G. Y.; Bain, R. E. S.; Miranda, O. R.; Rotello, C. M.; Rotello, V. M., “A Multichannel Nanosensor for Instantaneous Readout of Cancer Drug Mechanisms” Nat. Nanotechnol., 2015, 10, 65-69.